Explore the breadth of D&D’s monsters in this immersive 224-page volume filled with beautiful illustrations and in-depth lore. 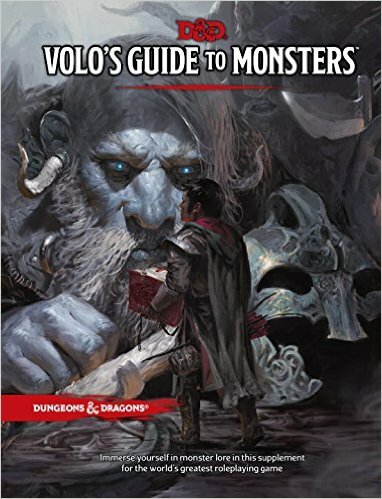 Volo’s Guide to Monsters provides something exciting for players and Dungeon Masters everywhere! 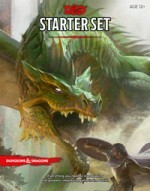 NEW Dungeons & Dragons Starter Set! The all-new edition of the world’s original and greatest fantasy roleplaying game has arrived! Now in-stock and on-sale at all Conspiracy Comics locations is the long awaited Dungeons & Dragons Next (5th Ed.) Starter Set. Over a year of playtesting lead to the design of the new edition and this box set features everything you need to start, or re-start(! ), playing: a 64-page book with everything the Dungeon Master needs to get started, 5 pregenerated characters for the players, 6 dice, and a 32-page book that lets you take your characters all the way from levels 1 to 5. And all for only $21.99! The perfect gateway to the new edition of D&D, this is a great opportunity to jump into the new edition and take it for a test drive before the release of the Player’s Handbook, Monster Manual, and Dungeon Master’s Guide over the rest of 2014. Conspiracy Comics Boxing Week Sale! Everything in the store is 10% off! That’s right everything! That’s not all though. When you buy $70 or more before tax worth of merchandise you’ll receive a mystery GIFT CARD redeemable immediately (at the cash) for $5, $10, $20, $50 or even $100 off your purchase, or you could win one an Anime or Comic gift pack! So with at least 10% off any purchase and another minimum $5 off your already discounted purchase of $70 there’s never been a better time to do your shopping! The sale is on at all our locations starting at 10am Thursday Dec 26th until 6pm Dec 31st. In addition to the sale noted above at our Burlington location we have many items discounted even further (selected t-shirts, wall scrolls, manga, graphic novels and much more). Don’t miss out. You could be walking away with a ton of your favourite stuff FREE! Best wishes and a have a safe and happy holiday! Web-swing into action with The Amazing Spider-Man, the latest spectacular expansion from Marvel HeroClix! These foil pack miniatures contains a random selection of 10 figures from ‘The Amazing Spider-Man’ HeroClix set with new dial designs! Relive iconic battles from the Star Trek Universe or create your own with the Star Trek HeroClix: Tactics tactical space combat system game. The Tactics Series II set features over 30 new pre-painted ships representing new races never before seen in Star Trek Tactics, including Romulans, Vulcans, Cardassians, Jem’Hadar, and Ferengi. The friends, fiends, and foes of the Pathfinder Adventure Path: Shattered Star invade your gaming table with Pathfinder Battles: Shattered Star, the brand new Pathfinder Battles prepainted miniatures set from Paizo Publishing and WizKids Games! This stunning set features 55 all-new prepainted sculpts drawn from the gorgeous art in Paizo Publishing‘s Pathfinder Adventure Path: Shattered Star. The Shattered Star Adventure Path puts heroes on the hunt for a sundered artifact of ancient runelords, exploring the most dangerous dungeons of the Pathfinder world! These stunning prepainted plastic figures bring the thrills of the Shattered Star to your game table! Dungeon Command features themed miniature factions designed to play as unified war bands, in a game eliminating luck-driven mechanics in favor of player-driven skill, creativity, and quick thinking. Let the age of goblin supremacy begin! Dominate the battlefield and crush your enemies with the third D&D Dungeon Command Pack, Tyranny of Goblins, now available at Conspiracy Comics. Earlier this year, Wizards of the Coast re-released their classic 1st Edition Rulebooks in premium reprints — now, you can add the v.3.5 Premium Editions of the Player’s Handbook, the Dungeon Master’s Guide, and the Monster Manual to your collection! The wait is over as Pathfinder finally releases its new miniature set: Rise of The Runelords! The set contains 65 new figures, 60 in the main set, 4 in the huge set and one giant rune figure.